Their Samosa pods (like a long doughnut filled with curried potatoes and carrot slivers) were fine; very bland on the spices. “There’s a samosa/chai special available,” the overly friendly cashier informed me. Okay, that sounds awesome…especially since they do make their chai tea fresh on the premises. It’s hot, creamy, and cardamom-y, ooommm yum yum! 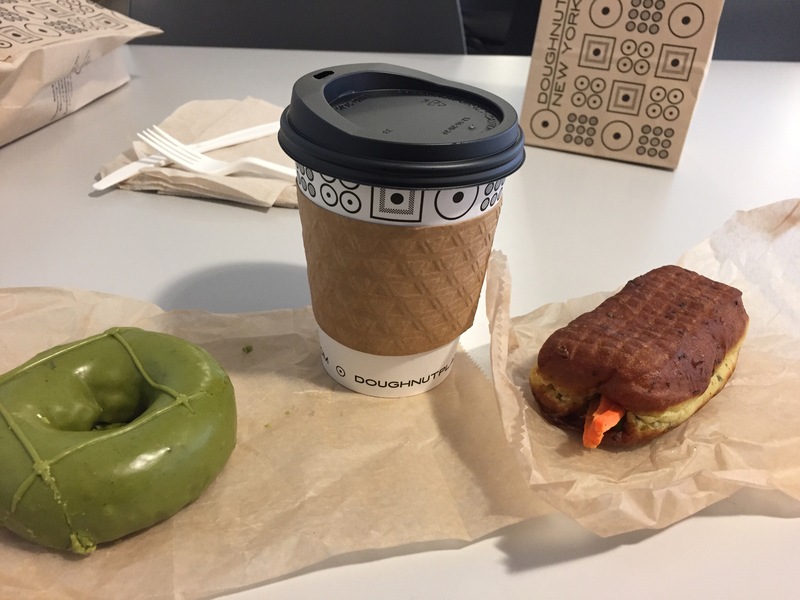 Dessert was the green mache cake doughnut, the second flavor of the month honoring the anniversary of the Tokyo Doughnut Plant branch. “It’s only good if you like green mache tea,” the cashier pointed out. I do like mache (a very heavy and hardy type of green tea), and the sweetness of the green glaze was a clean counterpoint with the chewy cake. Delicious!